Visit Amsterdam with us and see Rembrandt’s famous paint strokes at The Rembrandt House Museum and Rijksmuseum. Do you find European culture captivating? Does immersing yourself in a culture different from your own excite you? Don’t neglect that adventurous spirit of yours. Kiss America goodbye for a bit on the cool European streets where the summers are bright, the locals are friendly, and the sights are brimming with creativity. Marvel at the world renown works of Rembrandt Harmenszoon van Rijn, a 17th-century painter and etcher whose greatest creative triumphs are seen in portraits of his contemporaries, illustrations of biblical scenes, and self-portraits. Come see his famous detailed murals for yourself in Amsterdam’s Rijksmuseum and The Rambrandt House Museums. Travel back in time to the Dutch Golden age with Rembrandt’s innovative etchings and use of shadow and light. Embark with us, this week, on an exploration of one of Europe’s most influential painters and learn more about European history. Known as the greatest artist of Holland’s Golden Age, Rembrandt Harmenszoon van Rijn’s work and maturation as an artist saw three stages. With much artistic influence in the Leiden Period, the First Amsterdam Period, and the Third Amsterdam Period his work has spanned three periods of cultural revolution. Each period saw the perfection of one artistic medium. The 17th-century artist’s work were the primary centerpieces for major artistic periods lasting 33 years. During the Leiden Period, Rembrandt starting laying the foundation for his life’s work. Much of his artistic endeavors during this time were based on standing on the shoulders of his former masters. Taking work from famous artists, deconstructing them, and transforming them into his own, original masterpieces, Rembrandt grew as an artist. His paintings were often small, yet rich in detail, drawing influence from religious themes and allegories. 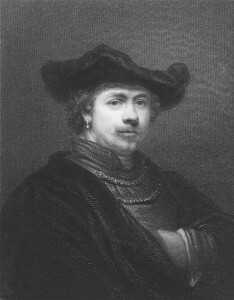 Rembrandt’s time in Leiden saw his first work with etching. Much of his fame is based on the widespread dissemination of pieces from this era. After spending many years perfecting his work and studying his master’s creative methods, Rembrandt started to conduct business. He connected with an Amsterdam entrepreneur who had a workshop that created portraits and practiced painting restoration. It was during the First Amsterdam Period that he created famous works such as The Binding of Samson, and Danae. His paintings evolved as well, as the talented artist started creating dramatic, large-scale biblical and mythological scenes, moving away from the small, detailed paintings of his past. His portrait work began, as well, featuring new facial energy that still accurately captured the likeness of his subjects. Famous European museums such as the Rembrandt House Museum, hold the artist’s work from this period, specifically. The Third Amsterdam Period saw the downfall of Rembrandt’s work. He produced no painted portraits and stopped accepting commissions for them. The “Rembrandt Myth” came from this period of artistic inactivity, and many assumed the death of his wife and rejection of The Night Watch, a world famous painting produced in 1642, lead to his downfall. Further research has proven this period of extreme demotivation, was in fact, based on creative disinterest. He had seen his methods stretched to their practical limits. The Third Amsterdam phase saw a notable variation in the few paintings he produced from 1642-1652. Small, and far less detailed, the degradation of his work was quite evident. The First Amsterdam and Leiden period, by far, saw the most energetic, detailed strokes of Rembrandt’s Career. Want to see his expert painting technique for yourself? Come away with us to Rijksmuseum and The Rembrandt House Museum, and envelope yourself in Amsterdam’s creative artistic history by seeing his world-renowned work with your own eyes! See Rembrandt’s Best Work In Person With AESU! AESU offers several trips to the Netherlands, including Euro Explorer. Explore the Netherlands and its spectacular landscapes, plus see Amsterdam and visit Rembrandt’s home and workshop! If you have any questions or want help booking your Netherlands adventure, please contact AESU by calling 800-638-7640, or fill out the contact form found on our website! This entry was posted on Wednesday, July 13th, 2016	at 11:27 am	. You can follow any responses to this entry through the RSS 2.0	feed. Both comments and pings are currently closed.